When a freshman undergraduate at Wisconsin State University – Oshkosh, I was required to read Henry David Thoreau’s Walden for an American Literature class. The copy that we had to buy also contained Thoreau’s essay “Civil Disobedience”. Since this was the fall of 1968, and it was Oshkosh, where the first semester was truncated by racial demonstrations and administrative and police over-reaction, the assignment was not without its sense of timing. Over the next few years, I would become pretty good at the Civil Disobedience part, but the theme and text of Walden has stayed with me. Not that I managed to simplify my life; I wanted other things too, but the trade offs were always between the simple life, and the “other” life I wanted: home, family and “stuff”. The last 45 years have been pretty good. Home(s)- check. Family, (special wife, three great daughters and now their families, complete with fine sons-in-law, and 8 grandkids, as well) check. Respect (great job and career, community service) check. And stuff, check, check, check. Nearing permanent retirement, I never imagined I would “quit” working, but now even modest job related headaches have me wondering – “why?” I find myself thinking about the simple life – a chair (the shack at Walden pond had three – one for sitting, one for company and a third for society), a table, a cup, a bowl and a spoon. Perhaps a rug on the floor – that should be enough. Perhaps I could go and buy some artists paints and a few brushes to paint a picture of “my” Walden, whatever form that takes. Of course, I could not buy the chairs and table, I would have to make those, and I would need at least some of my tools. I think about my time of relaxation and leisure, as my mind races. Books I have not read, ideas I have not written about, places I have not been. A pond needs a boat. 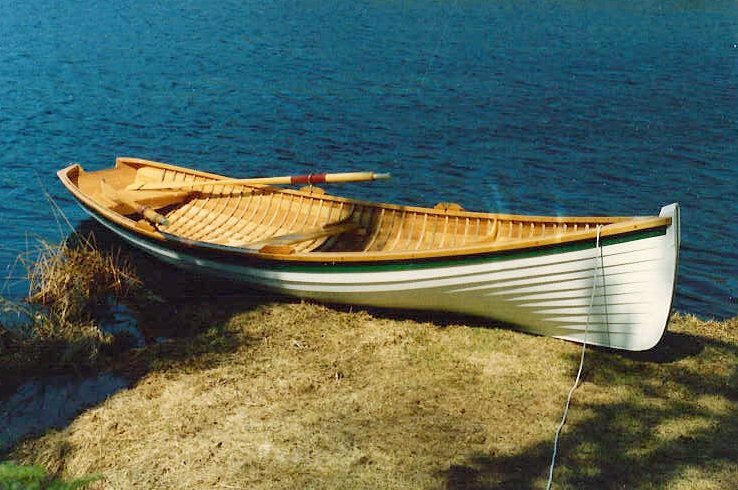 I have always wanted to build one, and a friend just gave me the forms to use in building a boat that I have always dreamed of – it is a simple one, pondworthy and true, a Rangely guide boat – called a “pulling boat” for it’s man powered oars. I see the Mother Superior in the “sport” seat reading her book, with me in the guide seat, rowing – on Moose Lake perhaps, or Golden Lake – or Walden Pond. I will build it. I will need time, and a place to loft it, my friend has a big shed, and if I stay out of his way, maybe I could do it there. And, it will take more of my tools. I still want simpler, quieter, easier. We’ve worked hard, been through alot, The boat might just be the last big project. It fits the simple life – Jeff says no motor. But a 2 1/2 would be nice, just in case I get tired, or we get caught in the rain. We wouldn’t want the Mother Superior’s book to get wet.